For real, if you’re in the area, go to this place. It’s legit. This one is REALLY specific. 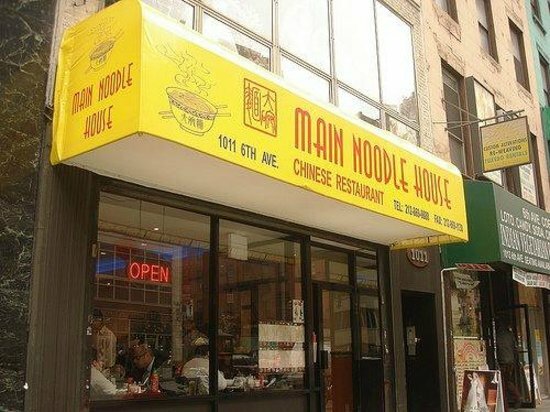 I’ve been going to Main Noodle House on 38th and 6th in New York City since late 2008. It’s now late 2014. Every time I go (save for maybe one or two times), I get the exact same thing (I’m actually a 85 year old man): egg roll and bowl of chicken, vegetable and Udon noodle soup. I go, on average, once a month. That’s approximately 80 repeats of the same order. Now, I realize, this place is in a highly trafficked area in a highly populated city. They make their money by turning the tables over quickly, so the idea that they should remember any single customer is a little crazy. However, it always struck me as odd that–up until recently–I never got more than a blank stare and “What would you like?” from any of the many polite, but curt waiters. She smiled again (a record, I’m certain of it) and retreated. Blown away, I looked around to see if anyone else had seen what just happened. Obviously, this would’ve felt good anywhere but at this particular establishment, it felt even better. Let’s not lie to one another… if you’re a white patron, the servers at these Chinese restaurants aren’t typically the chattiest folks. Straight business, typically. Take the order, return with the order, leave the check. Not much deviation. So, to actually crack the code, that felt pretty damn special. Polar Opposite of this Feeling? : Trying a new place because a friend (likely, female, let’s be honest) wants to do something different! only to find out that whatever you ordered at this new place doesn’t even come close to how good it is at the original place.